Parents who practice attachment parenting have specific guidelines that they follow, and they expect that from anyone who cares for their children. This can cause a lot of problems. For instance, if you believe in cloth diapers, organic foods, and no television, but your daycare provider insists on disposables, microwave meals, and sitting children in front of Barney for hours…well, obviously it’s not going to work! When finding a daycare provider, I think a very, very essential quality is agreement. It is so important that you and your caregiver agree on your choices as much as possible. This is a person with whom you are trusting the care of your child, so you have to agree as much as possible. I call it Attachment Caregiving. 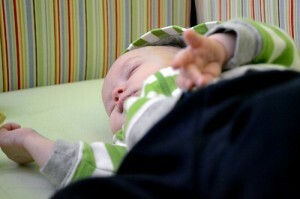 When Michael and I met with our daycare provider for the first time, we had one glaring concern: nap time. Naomi has always napped with one of us cuddled up beside her or in our laps, and has never been a good “fall asleep on her own” sleeper, so that was a major concern for us. As I have said, we have been very blessed to have discovered a daycare provider who had the same kind of ideals with regards to discipline as we do: kind words, gentle discussion, and simple redirection. We were adamant that there be no “cry-it-out”, no matter what the situation. But what were our alternatives? There was no way our daycare provider could sit in a rocking chair while Naomi napped for two hours. The Wednesday before we started daycare, I decided that I had better get Naomi prepared. I didn’t want her crying and fussing to keep the other kids at daycare awake for the whole of nap time. So, I brought the playpen upstairs from the basement where it had sat almost Naomi’s whole life, and set it up. I put in her favorite blanket, a few cuddly stuffed animals, and her pillow and laid her down in it. I sat on the bed and spoke to her gently. She stood and cried. I continued to speak gently to her, I stroked her head, wrapped her in her blanket, and laid her down. It was a challenge, but I never left her to deal with it on her own. I talked to her quietly and lovingly cared for her, but I explained to her that she needed to sleep. And we did that… for an hour. It was so difficult, but finally I laid her down, stroked her face, and she fell asleep and slept for an hour. I was there by her side the whole time: gently, lovingly, compassionately present. The second day, we repeated this process. I laid her down, stroked her face, and quietly soothed her. This time, it took a little under an hour — not a great achievement, but an achievement nonetheless. On the third day, Michael was home during nap time, and this time he did it. To my complete shock, it took twenty minutes! Twenty minutes!!! Finding someone who will practice attachment caregiving, someone who agrees with you in how your child is to be treated is very important, and I cannot imagine any other person (who isn’t me or my husband) looking after Naomi every day. Nada is a first-time mom to a delightful little girl and the wife to a wise and wonderful man. With a background in fitness and nutrition, she enjoys healthy cooking, green cleaning, and especially writing, and has acquired a vast knowledge of interesting little facts…about everything! She aspires to be a Godly woman that her daughter is proud to call “Mom” and through her blog, miniMOMist, she discusses how attachment parenting, minimalism, simplicity, and frugal living help in her everyday mission. This is a well timed article for me. my baby girl starts to daycare in next week and hasn’t ever slept in a crib yet. this gives me a sample roadmap to follow to help her adjust to napping in a crib. thank you for sharing. So glad you found a great daycare provider. I used to nanny for an AP family and tried to make my care as consistent as I could with what the parents would do…it involved a lot of babywearing and gentle redirection, and it was great prep for my own parenting journey a few years later.